Boonville, IN. – Joyce June (Snyder) McKesson Foster, 93, of Boonville, Indiana passed away on Sunday, November 11, 2018 at Transcendent Health Care- North in Boonville, Indiana. Joyce was born in St. Sturgis, MI. on May 28, 1925 to the late Hershel Faust and Vera Emily (Larrabee) Snyder. She was a member of Kingdom Hall of Jehovah Witnesses in Boonville, Indiana for 65 years. Joyce retired after several years as an Accountant. She loved music and had a beautiful voice. 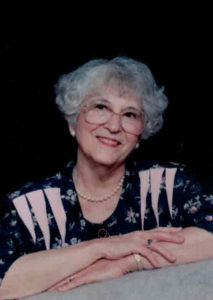 Joyce is survived by her children, Kimberly Pearson and her husband, Andy of Flowery Branch, GA; Knight McKesson Jr. of Nashville, Tn; Colleen Mathews and her husband, George of Jackson, MI; Susan Roberts and her companion, Tamera Carlin of Boonville, IN; grandchildren, Kirsten, Karen, Nicole, Tyler, Ryan, Lindsay, Steven, Craig, Michelle; 17 great-grandchildren; 9 nieces and nephews. A memorial service will be held for Joyce on Wednesday, November 14, 2018 at 6 P.M. at the Kingdom Hall of Jehovah Witnesses in Boonville, Indiana.